ProMix M A Controls | ProMinent Fluid Controls, Inc. 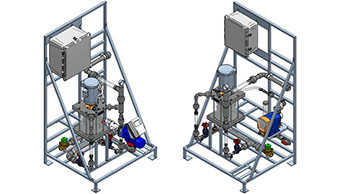 The ProMinent® ProMix™ is a pre-engineered polymer mixing system with intuitive controls. Designed as an in-line or makedown unit, the ProMix™ is engineered to meet liquid polymer applications utilizing diaphragm or progressive cavity pump technologies. The unique mixing regime delivers a highly activated polymer solution to every application with optimum performance.